Enchanting historic downtown. Soaring oceanside cliffs. The gateway to Acadia National Park. Experience an unforgettable cultural and scenic destination at Edenbrook Motel. You’re moments from the classic historic charm of downtown Bar Harbor, where coastal Maine life is at its best. Stroll down Main Street to peruse shops and galleries. Get a bite of fresh seafood at an array of restaurants and cafes. Or just kick back, breathe in the tangy air of the Atlantic, and soak in your stunning surroundings. If you’re in Maine for Acadia National Park, you’ve found the perfect place to stay. Edenbrook Motel sits minutes from the lush mountain forests, jagged oceanside cliffs, soothing waterfalls, and pristine glacial lakes that make Acadia a world-class destination. Acadia National Park is a rare place where granite peaks rise 1,500 feet through the verdure of northeast forests to welcome travelers. Discover 50,000 acres of surf-battered shoreline, stunning forests known for explosions of fall color, marine and animal life worth watching, and a rich American cultural history dating to the 1700s. Hike 120 miles of trails on the Acadian coast through the northern forests that have helped make Acadia the Crown Jewel of the North Atlantic Coast. Bask in the sun at Sand Beach or enjoy a sunset from Cadillac Mountain 1,500 feet above the Atlantic.Take a scenic drive to watch the surf sail 40 feet through the air at Thunder Hole. Ride horses or bikes on 45 miles of carriage roads complete with picturesque stone bridges. Whether you want a calm, relaxing vacation or one full of adventure and scenery, Acadia has you covered. Bar Harbor, established 1796, maintains the historic character and colorful seaside charm particular to the American northeast. Though only a 5-hour drive from Boston or 50 miles from Bangor International Airport, the small-town character of Bar Harbor is infectiously outdoorsy and artsy. Niche museums, cultural landmarks and buildings, and a surprisingly deep roster of restaurants round out the outdoor life celebrated in the coastal town of Bar Harbor. 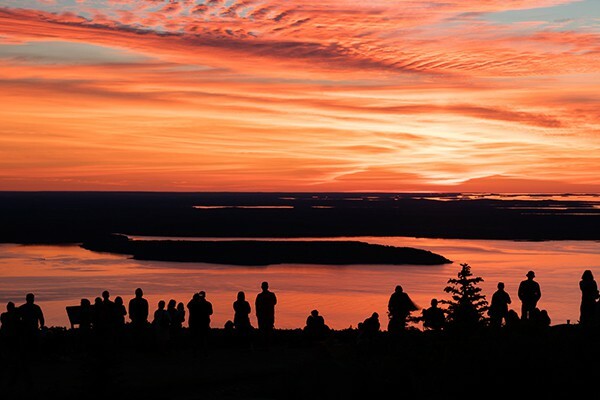 Though only populated by about 5,000 locals, Bar Harbor serves as the unofficial headquarters for nightlife, dining, and shopping on Mount Desert Island and gives travelers access to some of the most stunning landscapes in the U.S. Hiking, biking, horseback riding, and carriage roads crisscross Mount Desert Island, making it the perfect place for a free shuttle system so you can take full advantage of the outdoor adventures on offer. In fact, the shuttle is a great way to connect to rock climbing, kayaking, tidepool or coastal exploration, or even a day lounging at the beach. Of course, you can also find guided tours of the island including historic downtown walking tours, entertaining bus tours, awe-inspiring lighthouse tours, a wide variety of boat tours, quaint carriage tours, or even high-flying glider or airplane tours. Sprinkle in some highly rated golf courses, music festivals, museums, botanical and butterfly gardens, live theater and entertainment, colorful shops bedecked with local creations, and a wide array of dining options (especially Maine lobster! ), and you’ll have all you need for the perfect vacation. Book your room now to experience all the adventures waiting for you on Mount Desert Island and Acadia National Park.